I am in the final hours of painting my band painting which will be titled "Shows Over" (courtesy of my son). 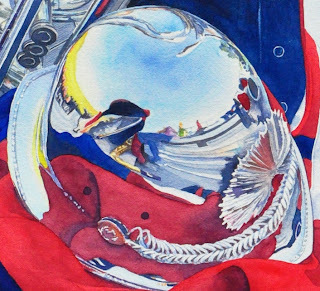 I thought I would take a few minutes to talk about painting metal and reflective objects. Painting reflective objects are like painting with puzzle shapes. Or another words, you have to look past what the object is and paint was is being reflected into the object. 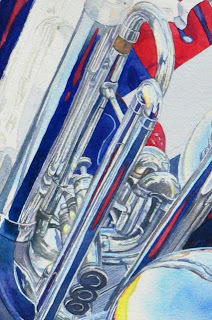 For instance, in my painting of the band instruments, I had reflections from: the sky, light posts, band uniforms, other instruments, metal benches, people and the football field to help define the shapes of the metal instruments. As you can see in these close ups, they become little individual scenes of mostly abstract shapes and colors. It is also important to look for and leave highlights. The highlights will help make the metal look shiny. I decided, for this painting, to concentrate on small sections at a time and bring them to completion. It was a lot less confusing this way. I have gone back into some of the sections every now and then to adjust values or add a touch of color to a section after viewing the whole painting. Working with silver has also forced me to look more closing at mixing grays. I have mixed every gray used in this piece. There are several ways to make luminous grays in watercolor. By mixing your own grays, you can weight them toward a cool gray, a warm gray, a blue gray, a purple gray, etc.